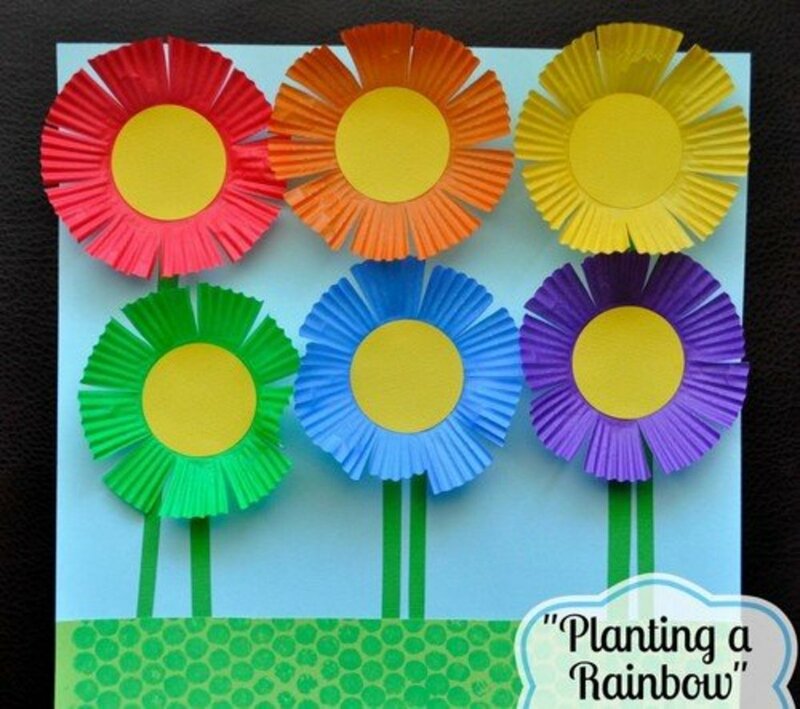 What are fun spring crafts for kids? 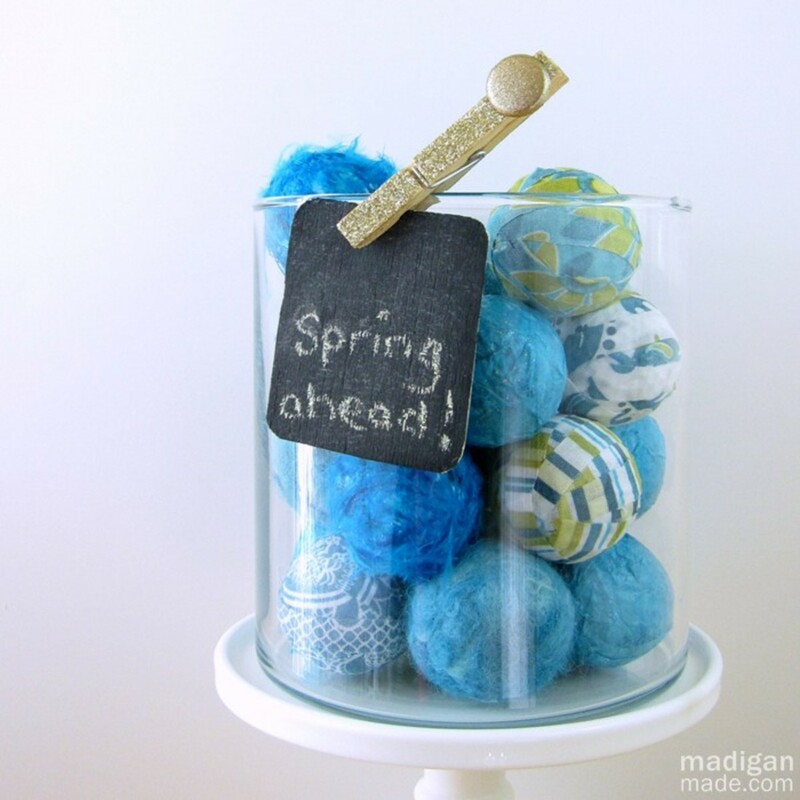 When I began collecting spring craft ideas for kids, I knew I would find a wealth of resources. However, I wasn't prepared for the variety of different topics and tutorials I would get. I've done my best to provide an overview and representative sampling of what is out there. This is by no means a comprehensive list, but it will provide hours of creative entertainment for you and your children throughout the spring season. Please respect artists' copyrights. Unless it is indicated otherwise, all ideas, templates, and printables are for personal use only. If you're interested in selling your creations, contact the artists directly to work out agreements. Thank you, and happy creating! 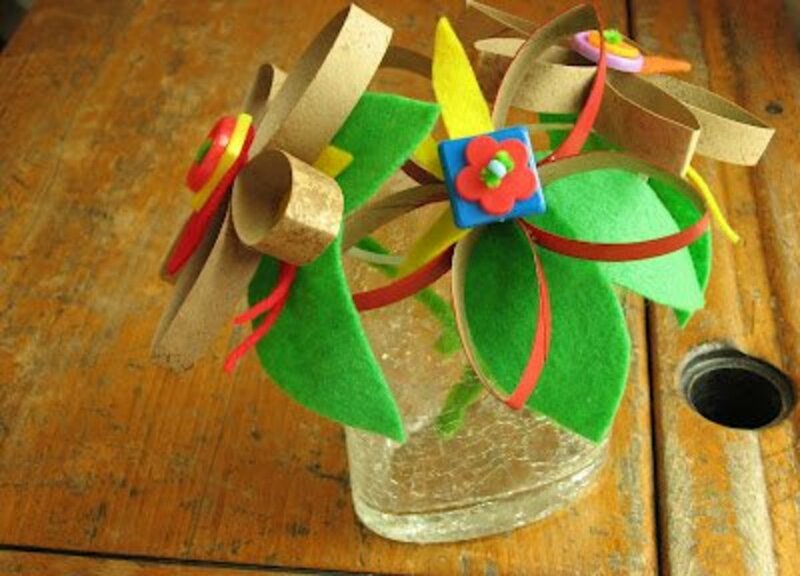 Make flowers using cardboard, buttons, and felt! If the cutting and assembling process is too complicated for your group of children, consider assembling the toilet paper flowers and cutting the felt leaves ahead of time. Your kids will still have fun choosing the detail colors and putting it all together. 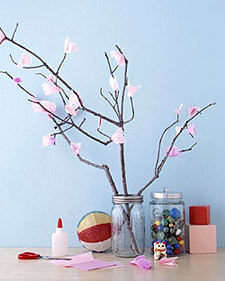 Use tissue paper to create lovely cherry blossom trees. You'll see many variations out there, so you can choose what you like and customize it to fit your style. As long as you can find enough branches, this project is about as simple as it gets. Dress up your tree with leaves and elaborate flowers, or keep it simple with a plethora of these little tissue paper cherry blossoms. 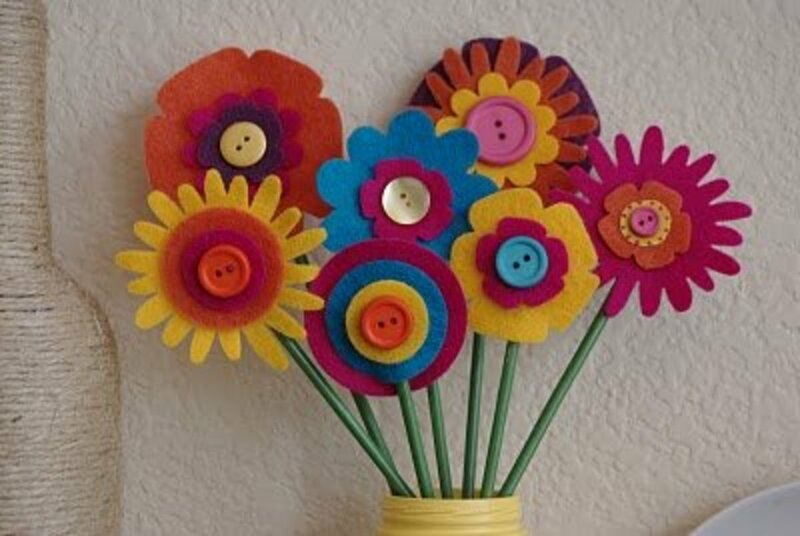 This felt flower bouquet makes the perfect touch for any kind of crafty flower center. Exercise caution when using a glue gun around children, even when you're the one controlling the gun. The project's author used felt flowers that she purchased, which works just fine. You and your kids can also cut out your own. Felt is a popular craft supply, so you can easily access some to make this spring vase. 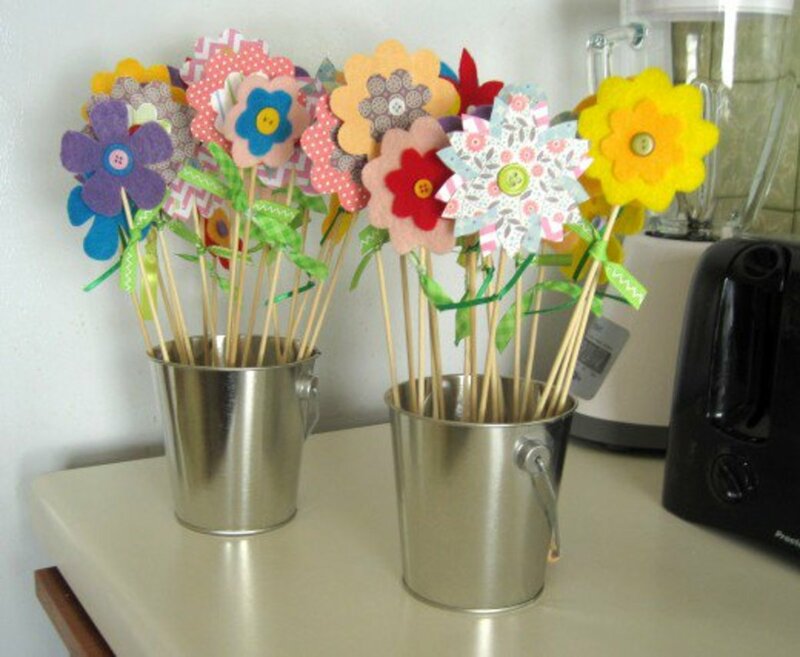 Save a tin can or two so that you can make these fun vases with your kids. If you don't want to use a glue gun, I would opt for tacky glue instead of Elmer's glue. The spring pastel color palette is beautiful, but you can mix it up any way that you like. The ribbon and buttons add a fun touch. Look for ribbons that have some sort of dots or other fun details. 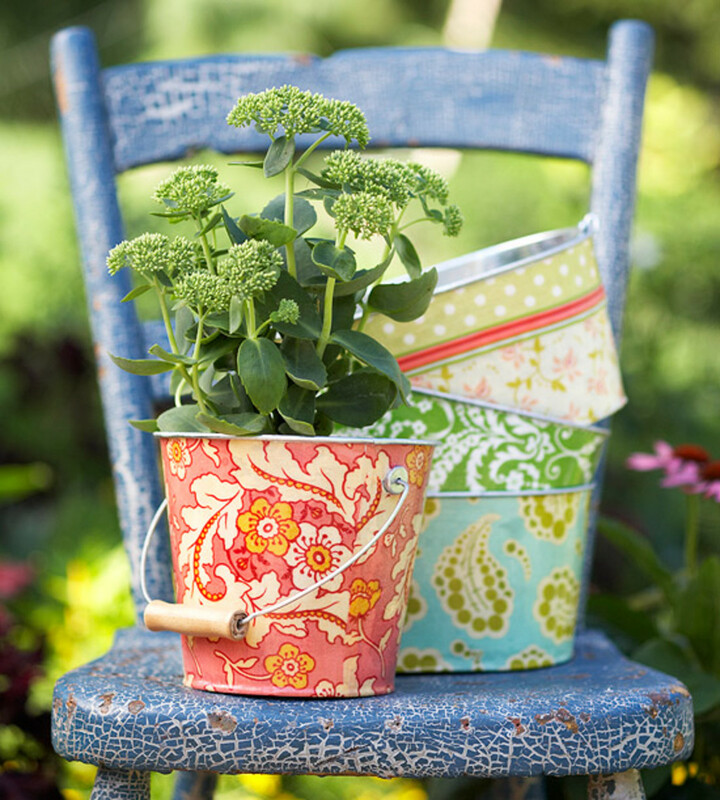 Use spring-inspired fabric to wrap containers for a festive touch! 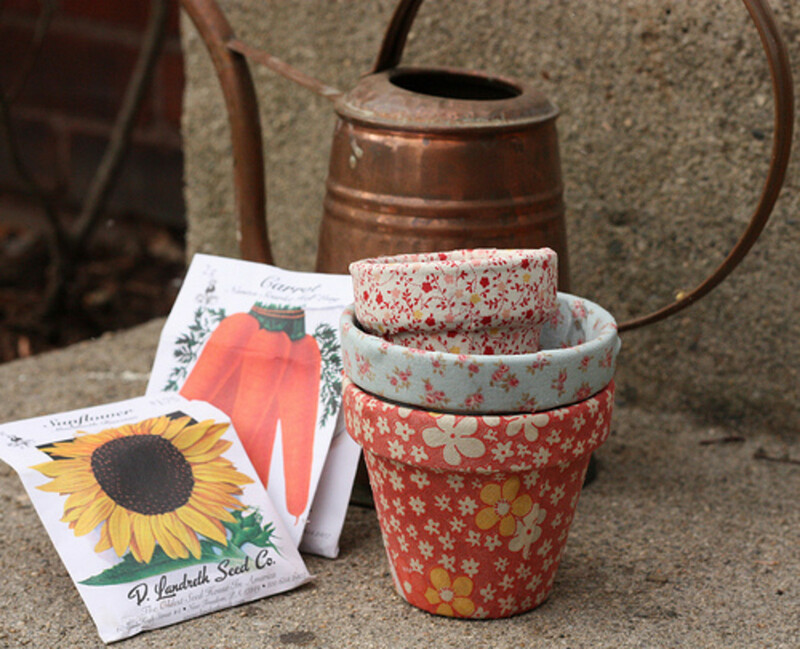 Fabric and decoupage medium will dress up just about any metal pail or flower pot. These tutorials keep the pails pretty simple with patterned fabrics, but you can customize this idea in any way that you like—embellishments, written messages, ribbons, etc. 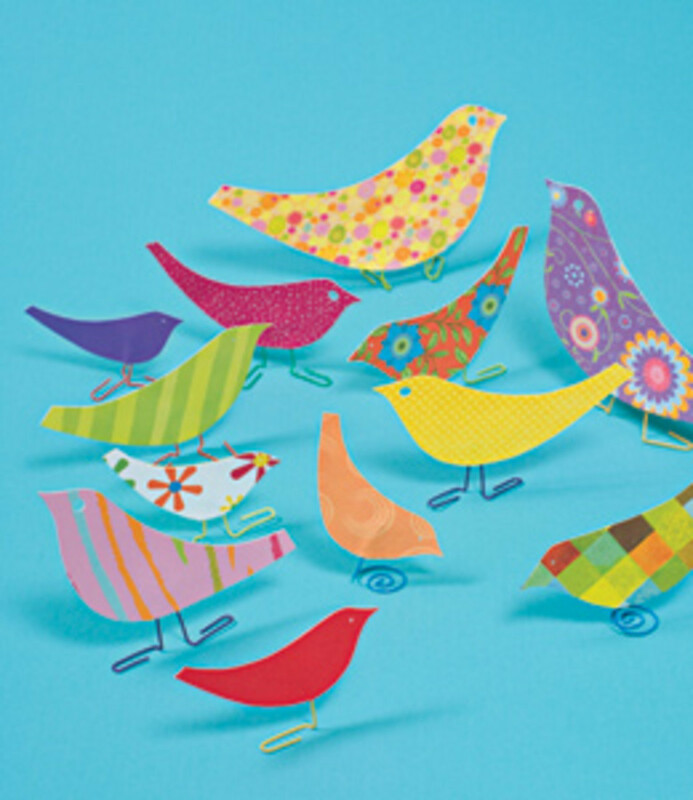 Make paper birds to welcome the spring season. This is a great way to use up extra little bits of scrapbook paper. Let your kids have fun sorting through your leftover stash. The paper clip feet idea is great. Hopefully, you won't have too much trouble bending them so the birds can stand up on their own.Learn how to make Curly Birds to add to the flock. 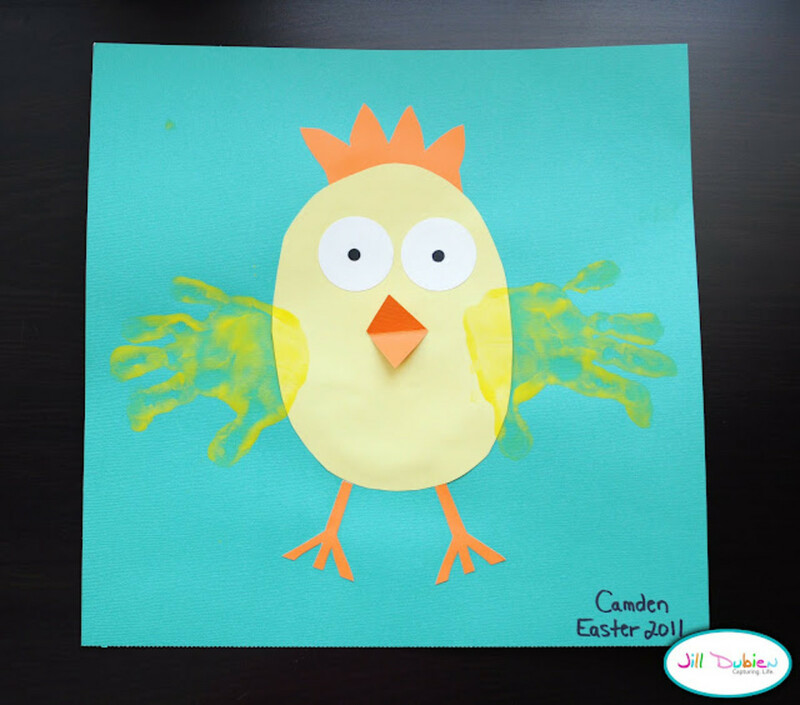 Use your kids' handprints to make these adorable chicks! It never fails to amaze me what people come up with for craft projects. Who knew that handprints would be perfect for chicks? The prints and beak give this simple little guy great character. 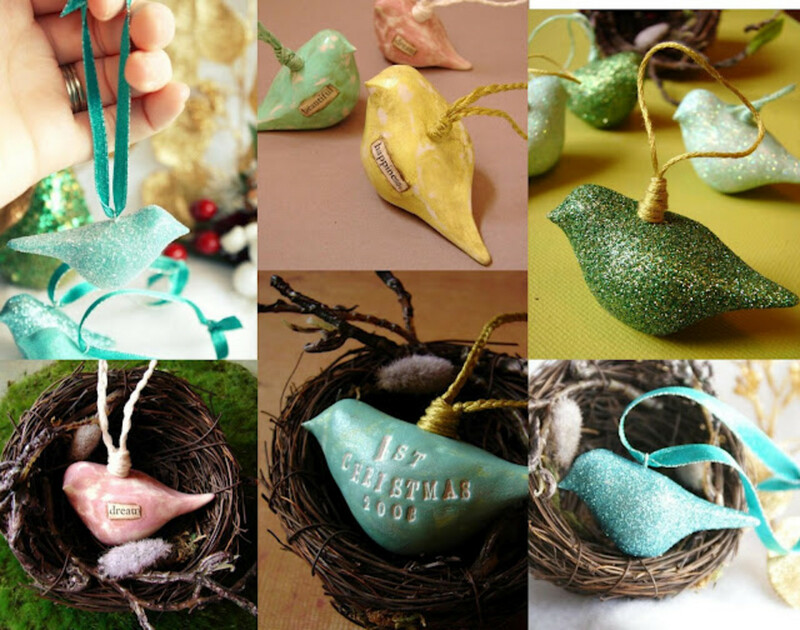 Use polymer clay to create these lovely bird ornaments. 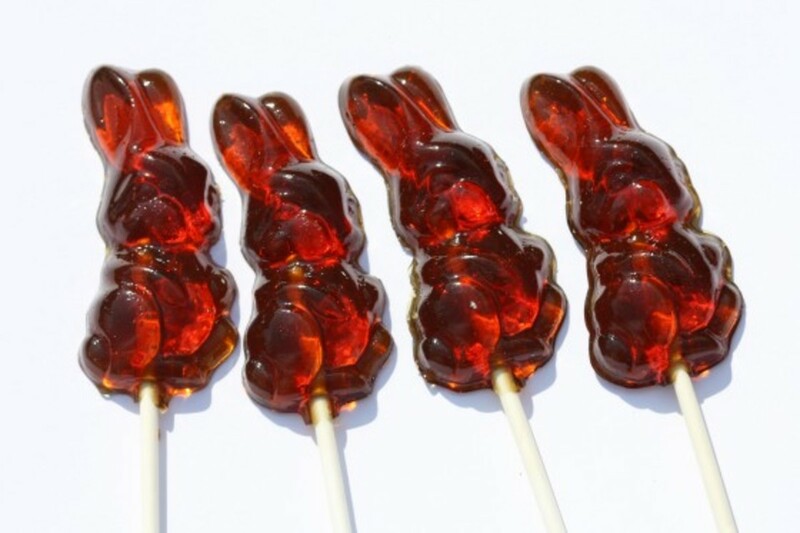 You can easily customize them for any season or holiday, including Easter or spring. Simply change up the colors and/or messages to fit your theme. The personalization options are endless. 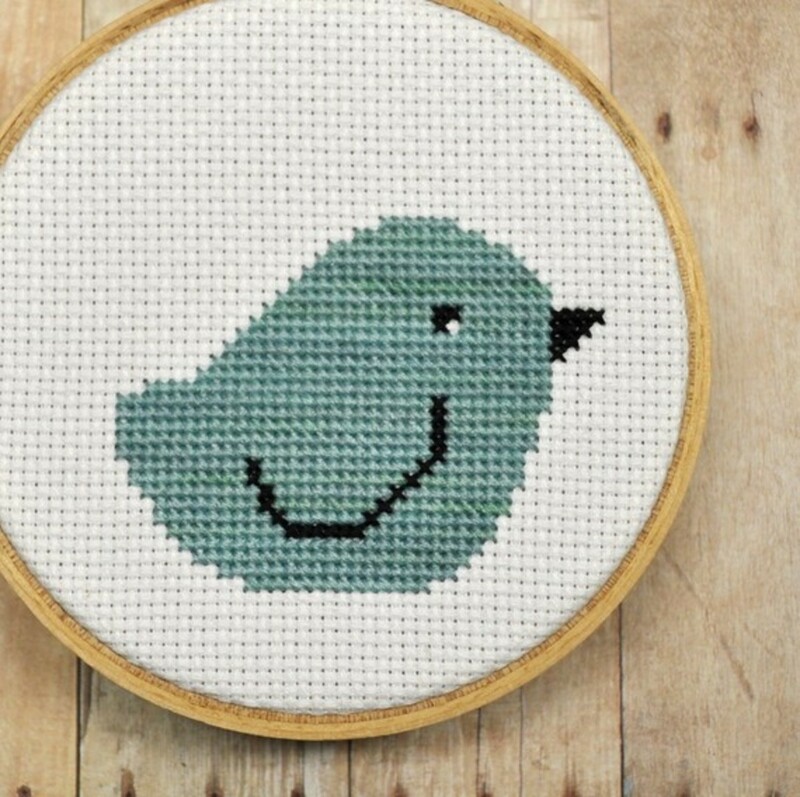 I generally stick to free tutorials and patterns for these craft ideas, but I couldn't resist including this cross-stitched bird. The price is very reasonable and will be well worth it. This is a great beginner cross-stitch project. Once the bird is finished, you can frame it, turn it into a pillow, attach it to a bag, etc. 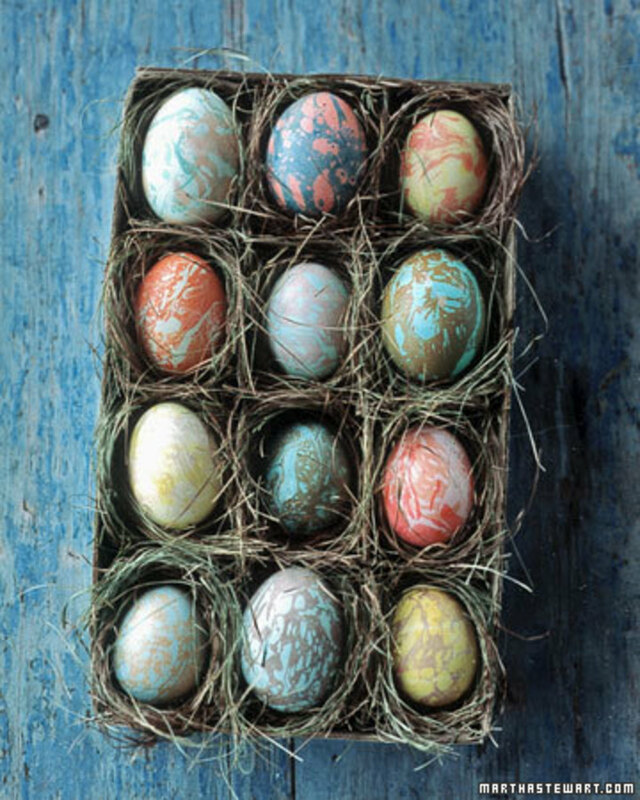 These speckled eggs are a classic kid's Easter activity. 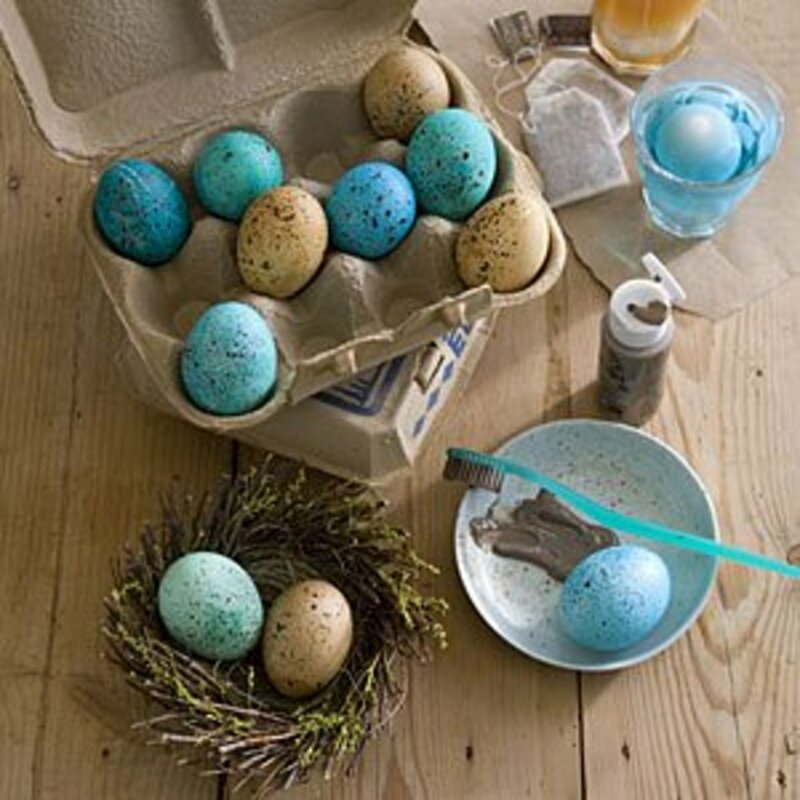 This tutorial includes separate instructions for tea-stained eggs, blue eggs, and speckled eggs. Martha Stewart recommends blowing out the inside of the eggs first. If you want to use regular hard-boiled eggs, however, I don't see why you can't. It's easy enough to make these again next year, right? This marbleized effect is simple and stunning. The nesting idea included in this tutorial is great, too. 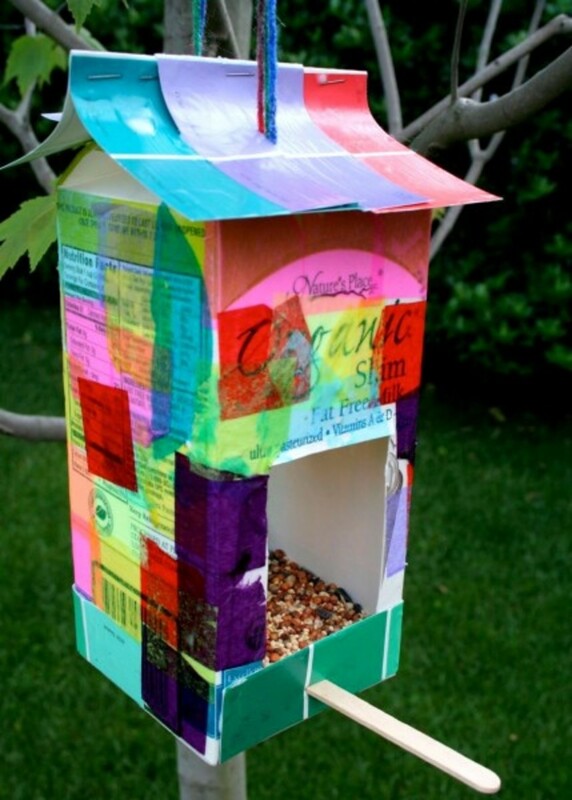 Just about any type of medium or large container (for juice or milk) will perfectly for a recycled bird feeder. If you don't use a waterproof decoration, I would recommend finishing it with a spray acrylic medium to waterproof it. All you have to do is cut a hole big enough for birds to enter, as well as snip a little bit below the hole to add a popsicle stick. This is the ledge that birds can land on to get the food! Do you still have your baking molds? 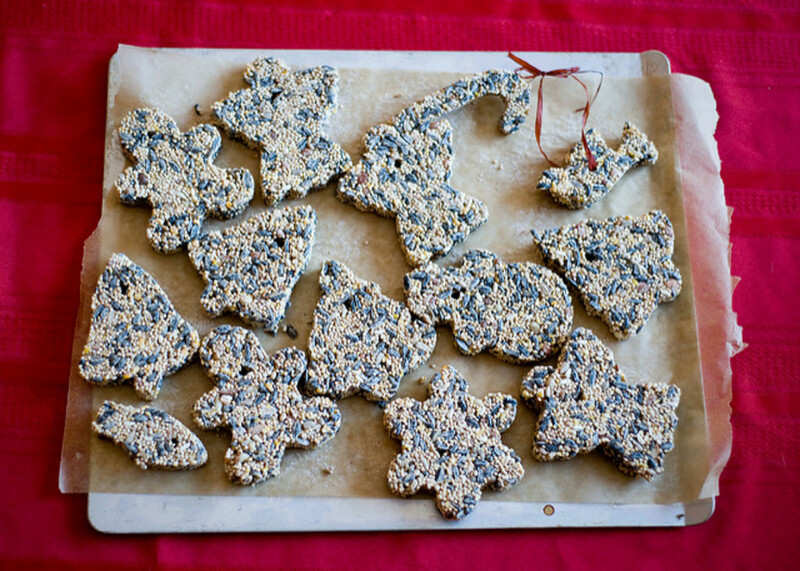 Pull them out one more time this year to make these bird seed cakes with your kids. The author has some great bird resources to share with your kids before or after making these cakes. There are wreath tutorials for just about every season and occasion, and spring is no exception. The effect of the baby grass with the fur yarn and pinned daisies makes a delightful spring wreath. This bright decoration will add a bit of cheer to your front door, living room, or kitchen throughout the spring. If you're in the mood to make some pinwheels with your kids, have them make a few extra so you can put together this whimsical wreath. 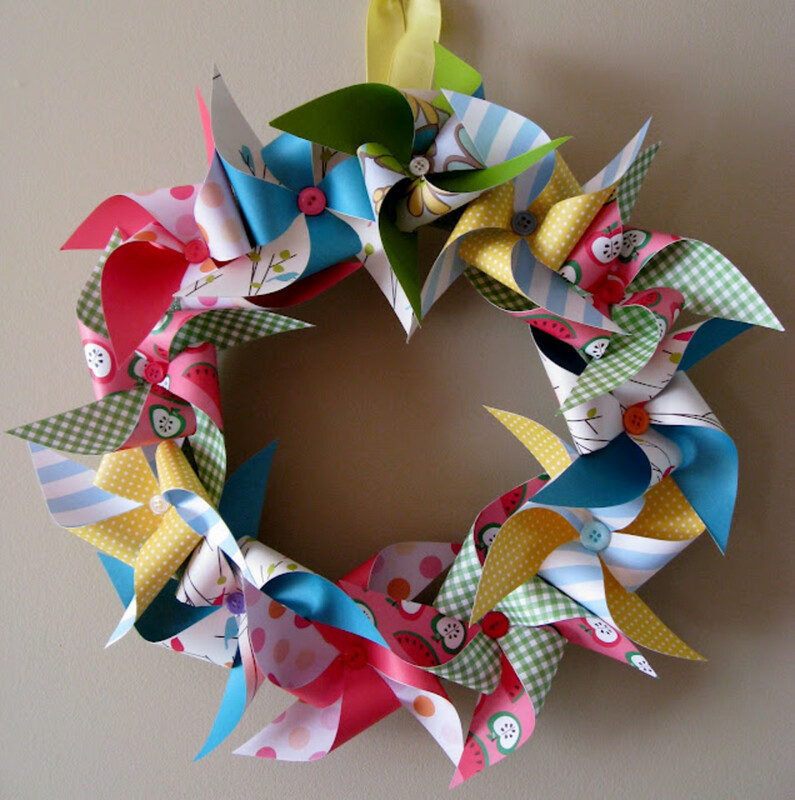 There are instructions for both the regular pinwheels and the wreath in this project. All you'll need to add to the wreath are buttons, pins, a strip of ribbon, and a wreath form. 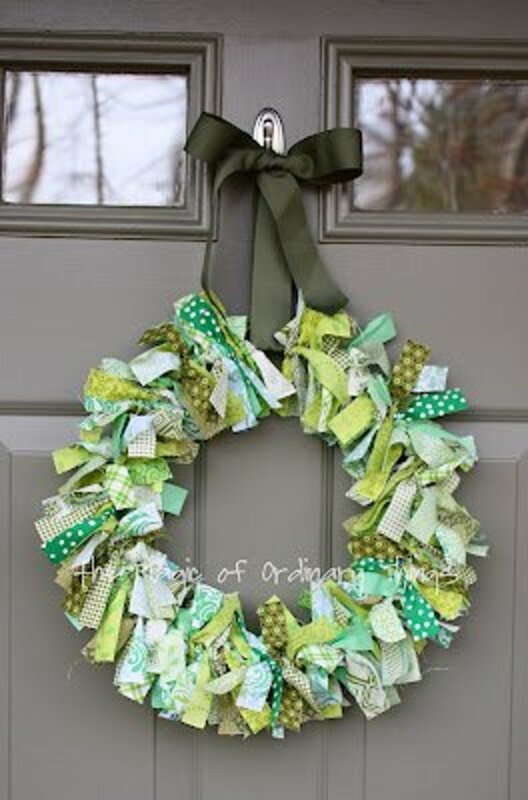 This rag wreath'scolor palette is perfect for any time in the spring. The concept is simple and a perfect way to use up extra scraps. Let your kids have fun sorting through your fabric stash and picking out the perfect pieces for their wreath. 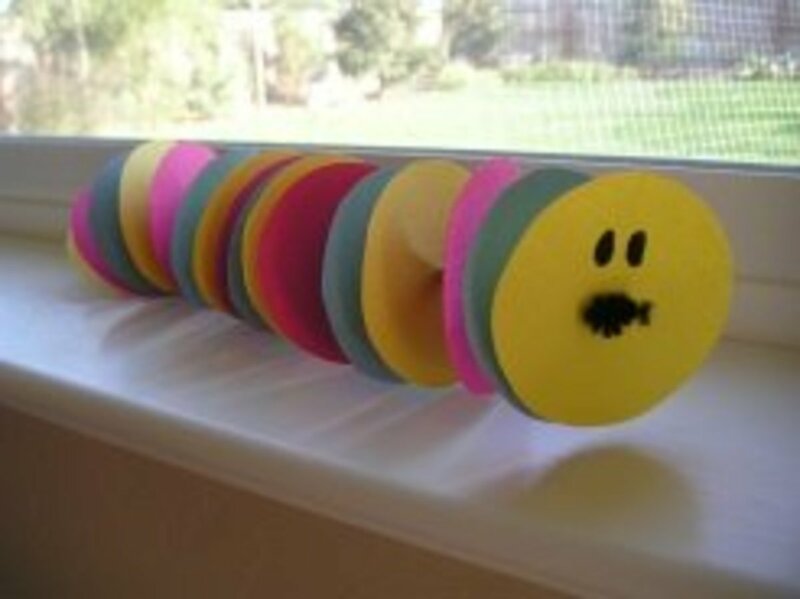 This little paper caterpillar will make any shelf or windowsill more cheerful. Younger kids will be happy cutting, punching, and threading their circles. Older kids may want to make more elaborate caterpillars with a variety of decorations and embellishments. I'm not a big proponent of purchasing many niche craft supplies, but paper punches are generally a good investment because they are more versatile than other scrapbooking supplies. 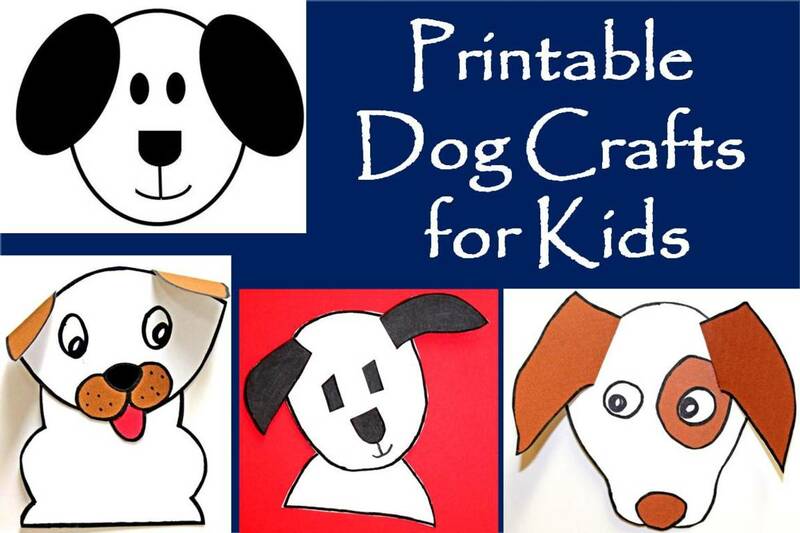 You can use them for card making and just about any other type of paper art project. 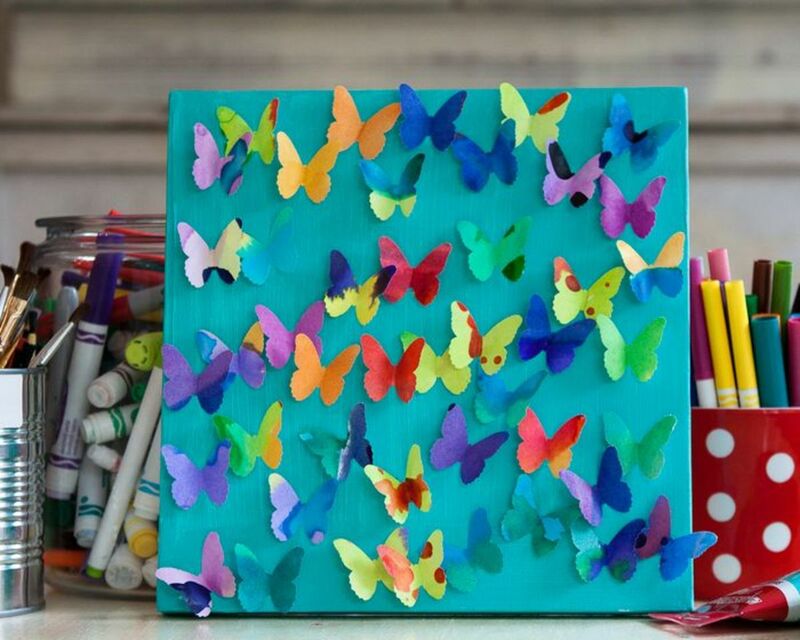 A butterfly punch will make this canvas art project much easier. 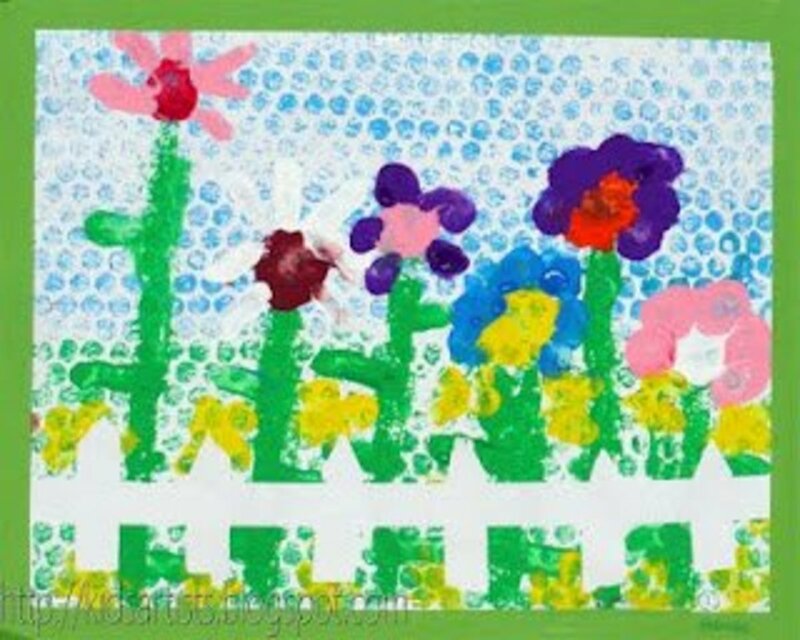 If your kids enjoy these type of projects and want to make of them, look for sales on bulk packages of canvases at your local craft store. 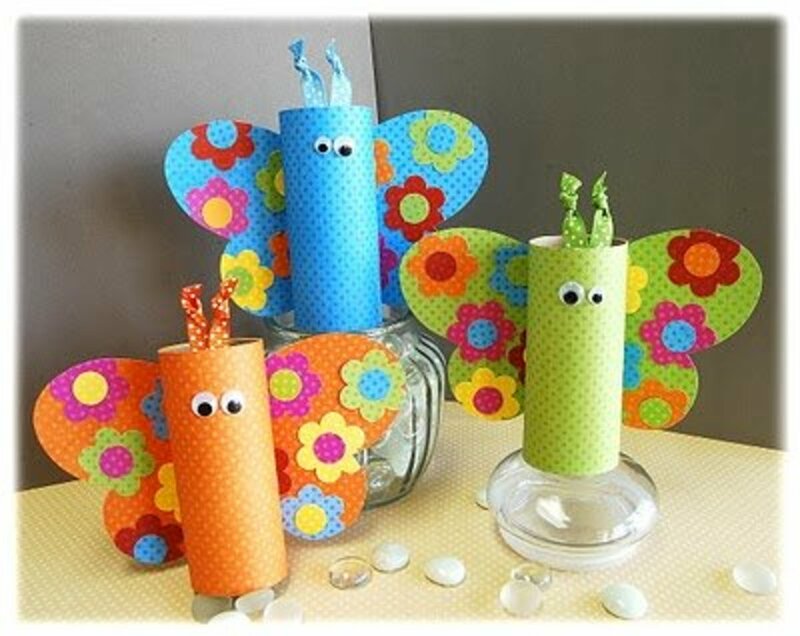 Transform old toilet paper rolls, patterned paper scraps, and ribbons into adorable butterfly decorations. Check dollar stores for inexpensive glass vases or containers to use as perches for these guys. 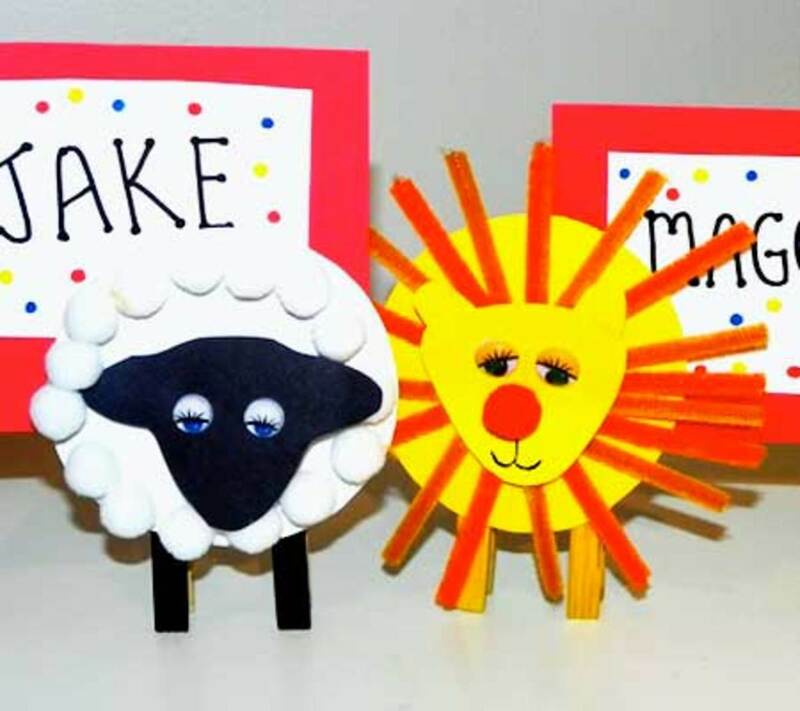 These lion and lamb nameplates would be such a cute table decoration for a party of spring event! 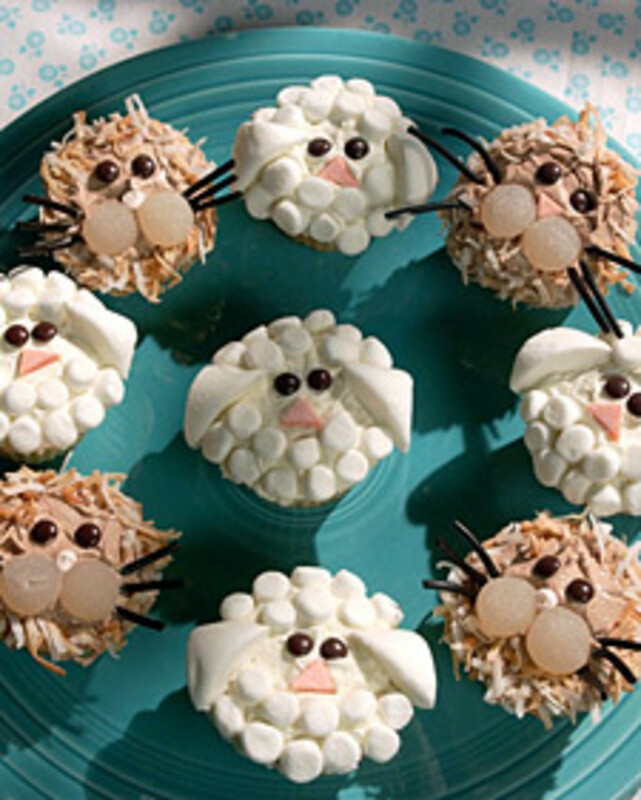 I'm sure that it's not a surprise that Martha Stewart would design a lion/lamb cupcake idea. This project is a little time intensive and does require some baking ingredients that you might not have on hand. However, the instructions are very easy to follow and, of course, the final result is adorable. 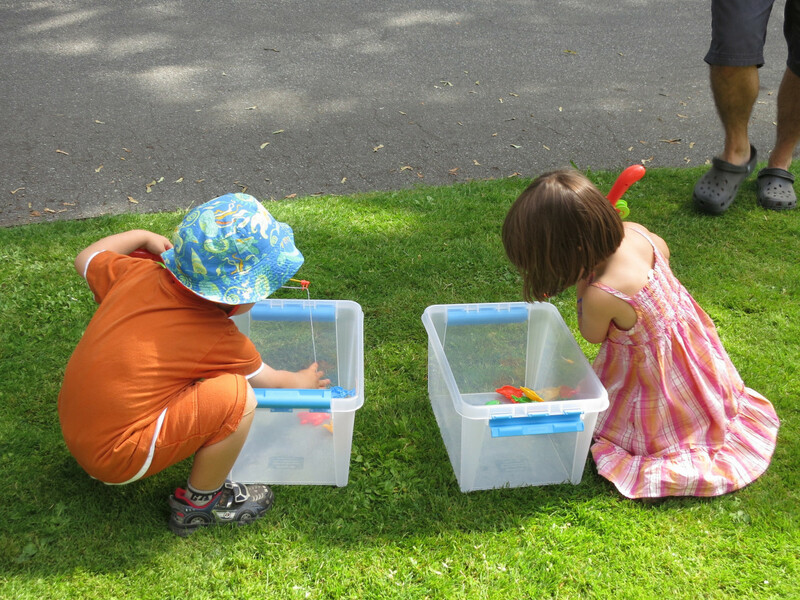 Never underestimate the importance of imaginative play for children. 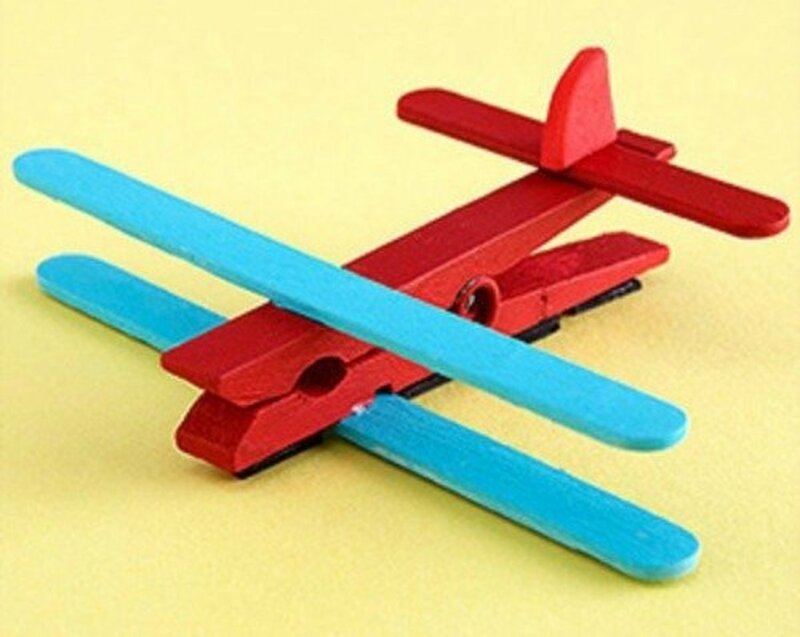 Even the simplest props can go a long way. 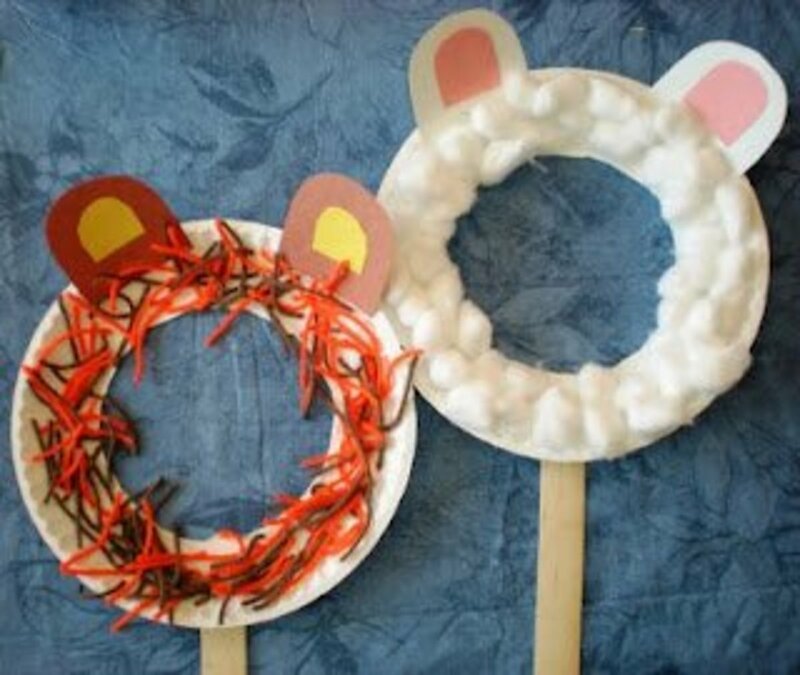 There is no end of possible stories that children will concoct for these two animal masks. If they really get into it, consider making additional play components for their stories, such as costumes and scenery elements. 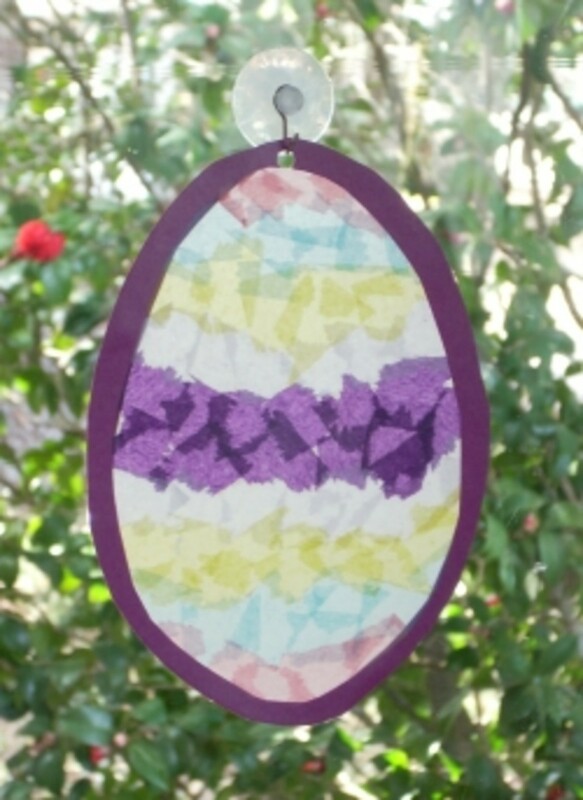 Bubble wrap and masking tape add neat texture to this simple window art. You can customize the colors and flower details in any way that you like. Encourage kids to be creative by using their imagination to add more to the scene (i.e. a sun in the sky, people, other plants, etc.). I have no idea how available liquid leading and clear gallery glass window paints are at major craft stores, but I do know that they are available online. I had never even heard of these window paints before, but the effect is really cool. This window art was not designed as a kids' project. However, it's bound to be fun for anyone. Have you ever thought about turning golf balls into vase fillers? The tutorial includes a handful of decorating ideas that range from easy to complex. You'll be able to find at least one idea that suits you and your kids. The clip on chalkboard sign is a great touch. If you don't already have a vase on hand, check the floral section of your local dollar store. I'm sure many of you are familiar with the concept of using a balloon as a round form and then popping it when the craft is complete. 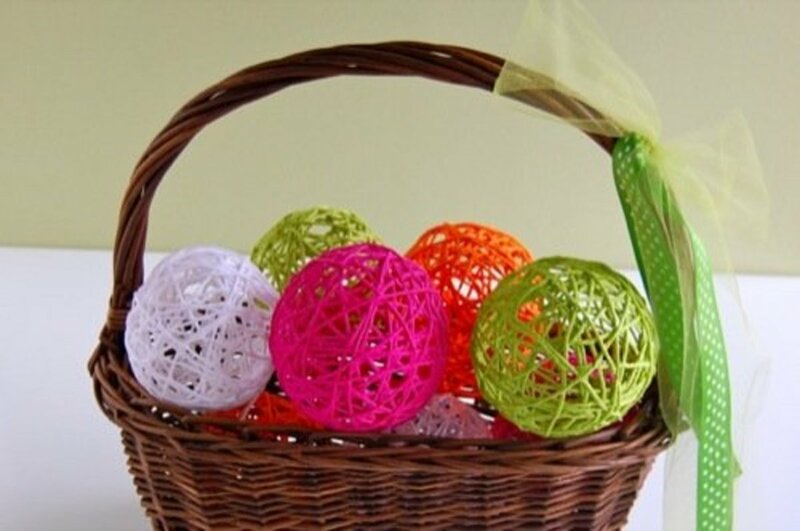 You won't need to blow up your balloons very much at all to get the perfect size for these decorative yarn balls. They will be right at home in any basket or vase. Candy molds are a lot of fun! If you don't already own some type of spring-themed mold (bunnies, chicks, flowers, Easter eggs), it's worth investing in at least one. You can use the same molds for a wide variety of sweets. 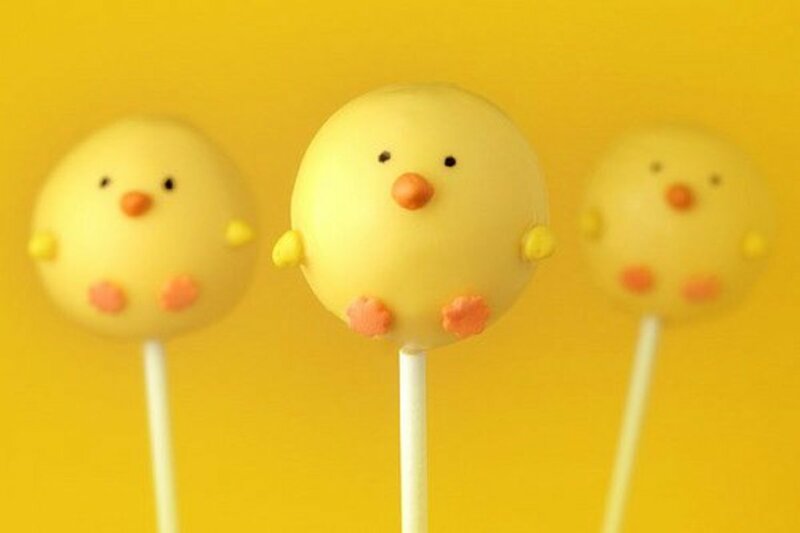 Make cake pops into chicks and flowers! 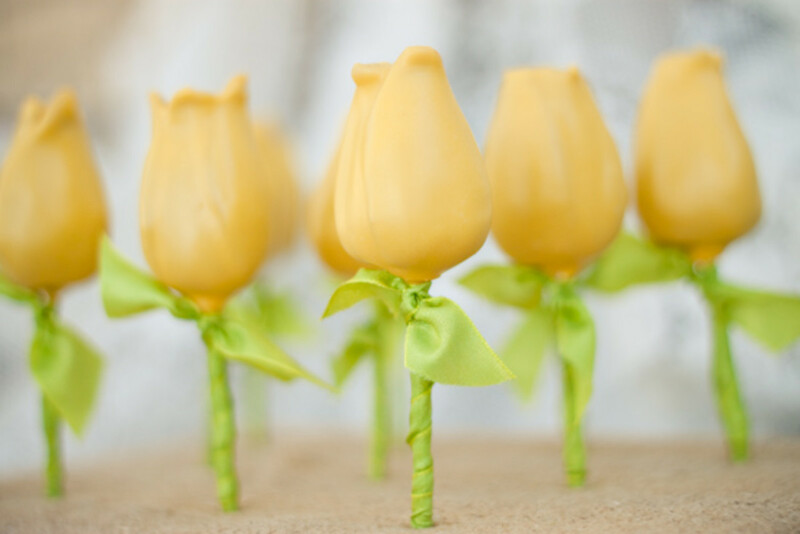 There are a handful of really cute cake pop ideas out there. These were two of my favorites. They are both a little time intensive and definitely kid/adult team projects, but they are well worth it. This would be a great dessert option after Easter dinner or for any type of special event in the spring. 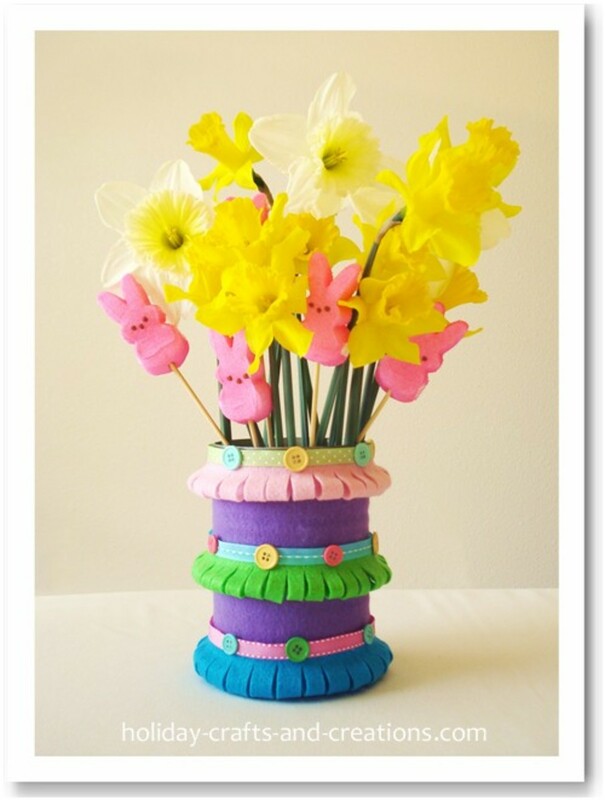 Make felt flowers and trees to make your home feel more like spring! That's awesome Caseworker! You'll have a lot of fun with painting and making caterpillars. You're welcome! I'm so glad that this was helpful for you. Fantastic hub! I have a craft event on Saturday for about 40 children and adults and was for once, quite stuck on ideas- I have loads now- My husband has now said that he will not be doing the painting table as he wants to work and make the caterpillar! Thank you so much, I always know where to come when the creative muse deserts me! I love this! 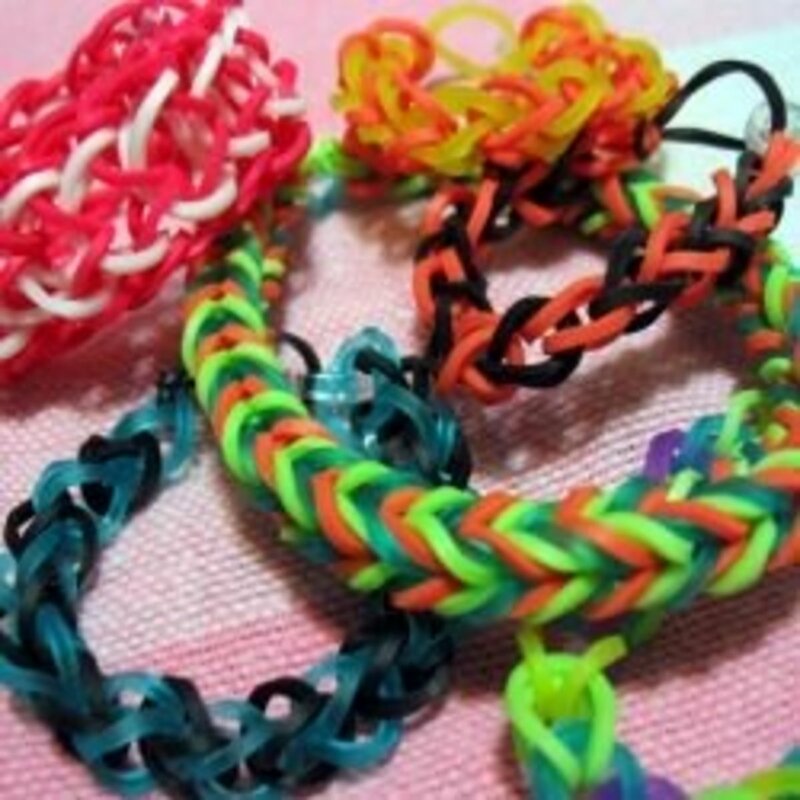 I lead arts and crafts for kids at an after-school program twice a month and am always looking for ideas! Thanks so much! Aren't those adorable? So many cute and creative ideas! Love the Easter chick cake pops. Oh my goodness, I love the felt button flowers! 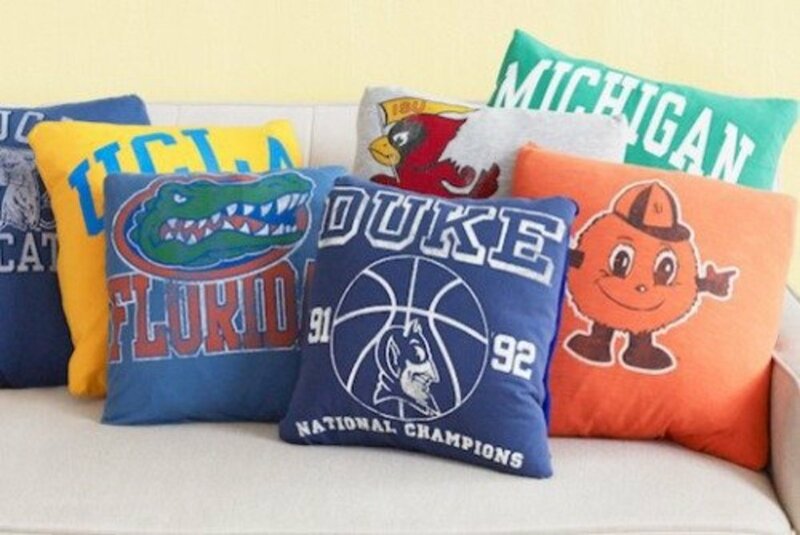 We'll have to make those over Spring Break! 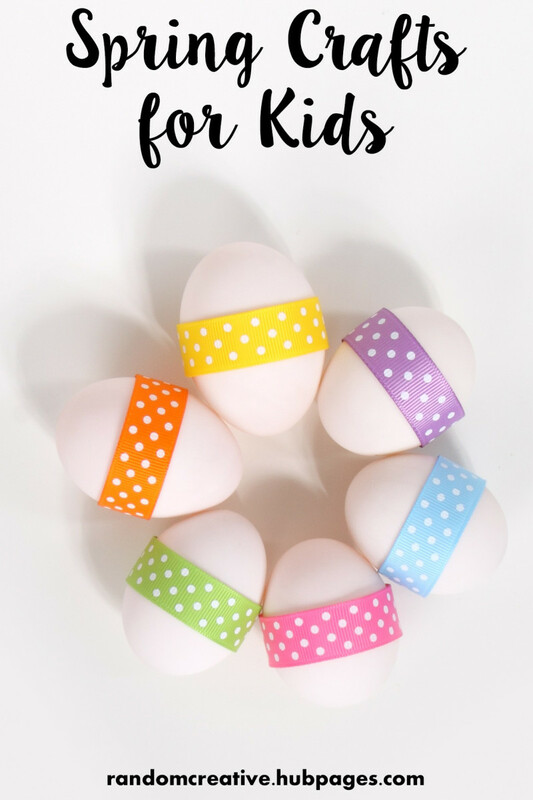 There are so many cute projects here - I might try making the yarn balls around eggs, so that we have cute little egg decorations! Great ideas here - and perfect for my four and six year olds! Thanks ishwaryaa and algarveview! I'm so glad that you both found ideas here that you like. 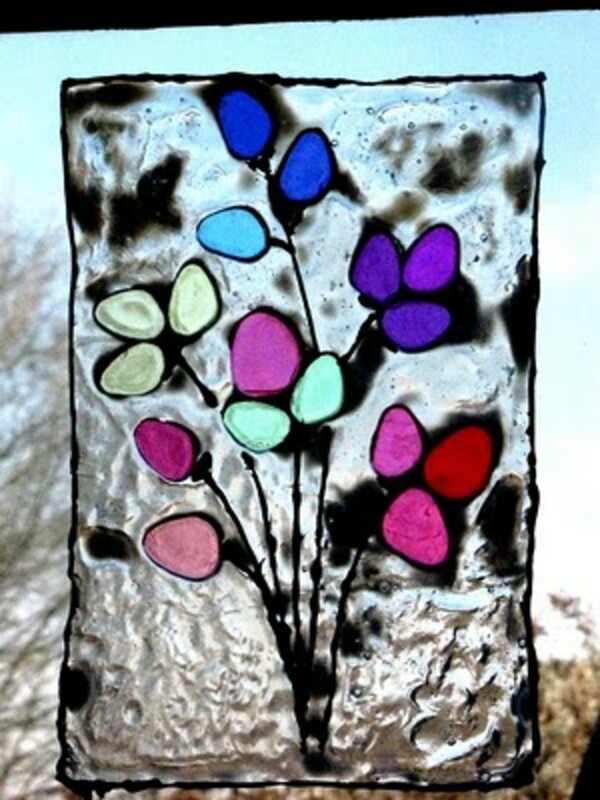 Lovely ideas, especially to do with my girl, she's all about flowers and butterflies... I'll probably try some of the easier ones, after all she's just turning four. Let's see how it goes. Really loved the ideas. Thanks. Have a wonderful day! So many cute & creative options here! Among these amazing creative crafts, I liked the best are polymer clay ornament birds, felt flowers with buttons & the first picture of a bunny in a cracked egg, holding a spring titled flag! Cute! My 6-year-old granddaughter would enjoy doing something like that. Green Art, Isn't that hilarious? I hope that you find some fun projects here to make with your grandson. You are right about the yarn balls working well for Halloween! The "Put a bird on it" video cracked me up, very funny! Awesome ideas here. I'm always looking for fun things to do with my 4 year old grandson. I plan on making the yarn balls for sure. They could be fun as a Halloween craft in black, white or orange with spiders added to them. So many wonderful craft ideas where to begin! I do like the idea of doing another Hub on just egg crafts alone but I can get lost reading all of these great suggestions! Thanks so much Jamie, Tammy, and Denise! And a special thanks to Tammy for sharing this! These are excellent and adorable. 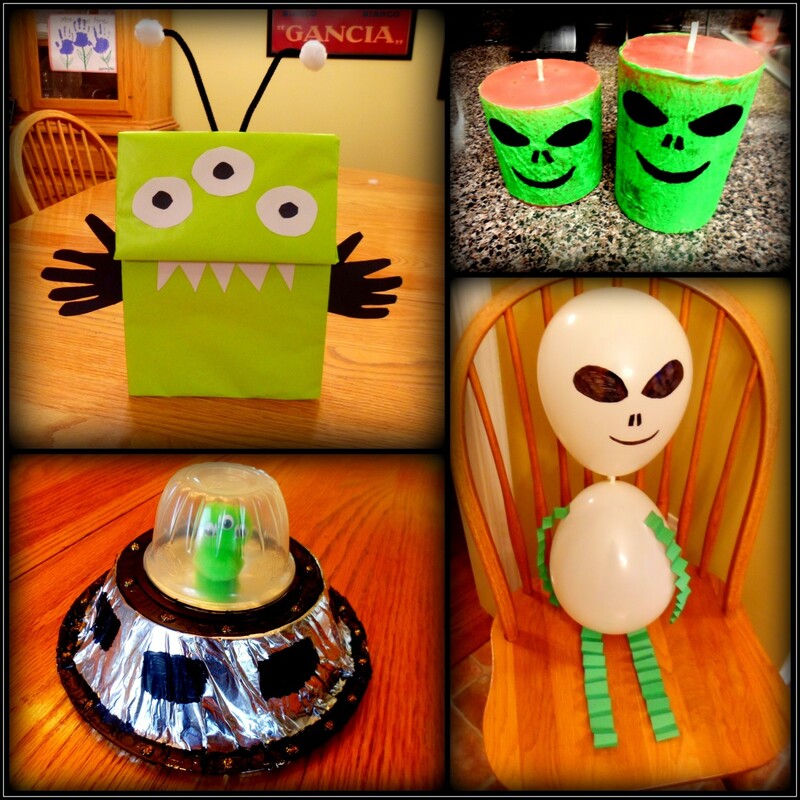 My daughter would love making all of these crafts. Well done and such a great selection of projects. I love it! Lots of cute stuff here, Rose. I especially love the canvas with the butterflies on it. Voting up and useful! Made, this is definitely perfect for you! ladeda, thanks for sharing this hub. :) It will be great for your teacher friend. Thanks Clover! You just add a photo capsule anywhere that you want a border and put in the border photo of your choice. Great ideas! Love them all, but my fav is the button flowers. PS. How do you get the flowers in between your capsules? Love the look, and I have a couple of hubs I would like to try this on. Thanks. So many cute ideas! Love the caterpillar and toilet paper roll butterflies! Yet another great Hub! I'm most definitely going to share this with my friend who's an elementary school teacher. I'm sure she'll love these ideas too! What a great hub with so many great ideas. It's perfect for me, as a mother of a 4 and 5 year old. I'll start cutting and gluing right away!